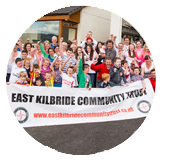 If you are interested in, or, already fundraising for charities, why not choose East Kilbride Community Trust as your chosen charity? All money raised and donated goes straight back to the community. That is 100% a promise! Even if it is your first time fundraising – we will be forever grateful for any donation big or small. Remember, anything is possible and if you wish to fundraise for our charity, we are more than welcome to be a part of the event. If you wish to fundraise for us then please click on the image below and register for a fantastic fundraising event!! !